B2Broker continues to expand its client list with its ready-made solution for launching a cryptocurrency exchange in one month. 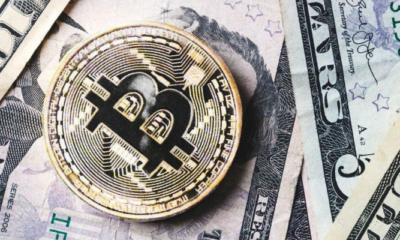 Cryptocurrency trading continues its rise in popularity as potential profits often eclipse that of traditional financial instruments many times over. 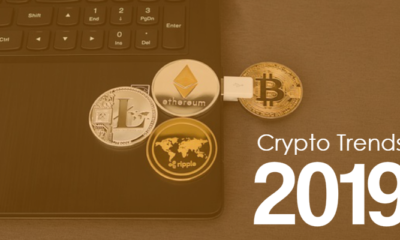 As a result, there has been substantial growth in the crypto exchange business in the last decade as the industry has evolved into this lucrative new sphere. As it stands, cryptocurrency exchanges tend to use in-house software solutions rather than those of the leading vendors of trading platforms. However, about 80% of what is available in the market is a rush job with unreliable crypto trading software. The fact is, most cryptocurrency exchanges do not meet the high standards of the brokerage service market and the quality of service required. This, together with the growing number of ICO projects that need to list tokens on cryptocurrency exchanges has resulted in many companies seeking to capitalise on the trend by implementing a white label cryptocurrency exchange or turnkey solution. Launching a cryptocurrency exchange can be a complex and costly process. It can take at least 9 months for development and testing and an investment of around $500,000 – and that’s for the development team alone. This makes B2Broker’s cryptocurrency exchange turnkey an ideal solution for setting up a cryptocurrency exchange. Not only do we offer the best technology on the market, we adopt an integrated approach tailored to individual and specific requests at a reasonable price which makes your crypto exchange business plan feasible. B2Trader is our new trading platform with a powerful matching engine where you can list unlimited tradable assets including digital assets, fiat currencies, forex and equities etc. The user interface, matching engine and all other parts of our solution are all customisable. To date, very few ICO projects have realized the full potential of their token. We have implemented an effective way of using your token on the platform. Simply set the discount percentage on the trade commission when paying with your token and users (traders and investors) will start buying your token, not just to speculate on its growth but also for real use. One of the most successful examples that highlights the full potential of this function is the B2B token. The logic is straightforward; the more people that use the platform, the more commission payments there will be with a discount (your token). As a consequence, there will be even more purchases of your token which will, in turn, significantly increase the demand for a token. Our web wallet offers a number of useful features including Integration with ticket systems including ZenDesk & Teamwox, Integration by API with any electronic wallets including Skrill, Neteller, PayPal, Yandex and more, integration by API with any PSP, integration with Bitcoin; Bitcoin Cash; Bitcoin Gold; Litecoin; NEM; Monero; Ripple; Dash; NEO; Ethereum, integration with any tokens based on Ethereum, NEM, NEO, integration with any KYC API providers, an administrative module for company employees and more. The solution also incorporates our Cryptocurrency Payment Gateway which includes implementation of the full nodes for each blockchain, all nodes can be hosted on your servers, detailed report for all transactions, unlimited blockchains and tokens, ERC20, ERC223 and ERC777, as well as any tokens on NEM and NEO, automatic transfer of customer funds to your cold wallets. As far as security is concerned, B2Broker offers a three-level system which includes amongst others, Cold, Warm and Hot Wallets, multiple security layers including two-factor authentication, anti-phishing features, geofencing which also detects VPNs and Tor exit nodes, database encryption, DDoS mitigation and enterprise-grade offline multisignature vaults. Sufficient liquidity is required to attract clients to an exchange. 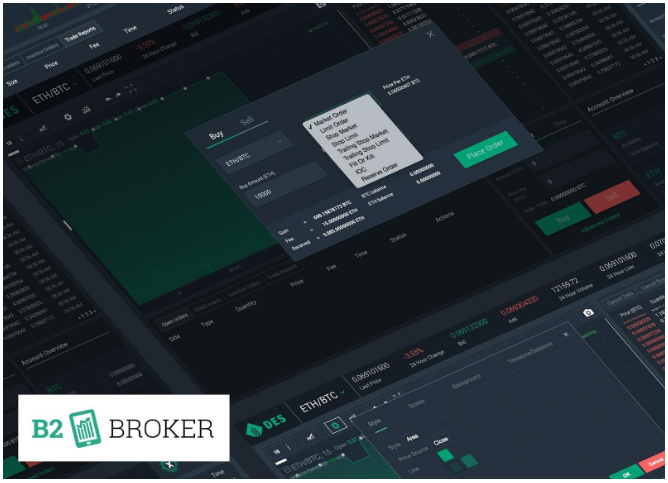 With B2Broker you can be connected to B2BX aggregated liquidity pool or other exchanges and liquidity providers. 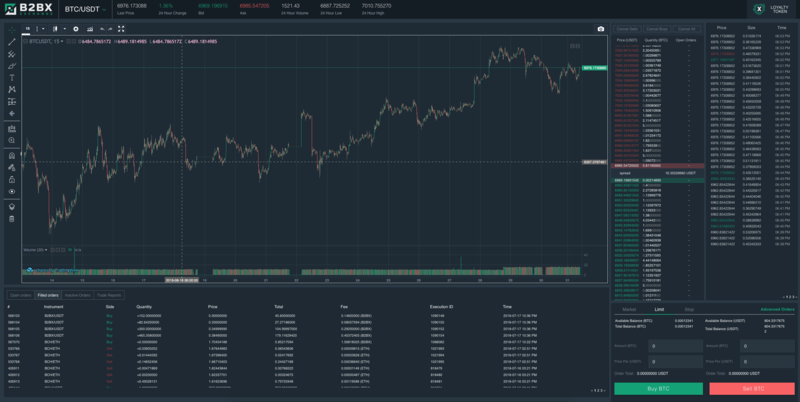 We offer liquidity for 26 crypto pairs 24 hours a day 24/7 with round the clock technical support, competitive commissions and spreads (Bitcoin spread less than 10 USD), fast execution and convenience of connection: Socket API, REST API, FIX API. With a host of other website & app features including a customizable exchange website, a fully customizable web application, mobile app for iOS and Android, professional charting (Trading view) and iFrame for website, B2Broker provides everything you need to set up your own Cryptocurrency Exchange turnkey. Our cryptocurrency exchange turnkey solution is an excellent business opportunity which will enable you to occupy a profitable niche in one of the fastest growing industries in the world. We provide a fast and cost-effective setup with a choice of personalised features all geared up towards creating a successful business. The world’s fastest, most secure and successful exchanges are powered by B2Broker! Click here to get started with setting up your own.